The Super Bowl airs on November 4, 2018 at 6:30pm Eastern on NBC. Michael Strahan won Super Bowl XLII with the Giants in 2007. From the publisher: From America’s favorite football player turned morning talk show host—a man who makes just about everything look easy—a mélange of stories and motivational advice to inspire the reader to turn up the heat and go from good to great in pursuit of their personal ambitions. From the publisher: Steve Young produced some of the most memorable moments in NFL history. But his most impressive victories have been deeply personal ones that were won when no one was watching. His remarkably revealing memoir is the story of a Mormon boy with a 4.0 GPA, a photographic memory, and a severe case of separation anxiety. Wade Phillips was the defensive coordinator for the Denver Broncos when they won Super Bowl 50 in 2016. 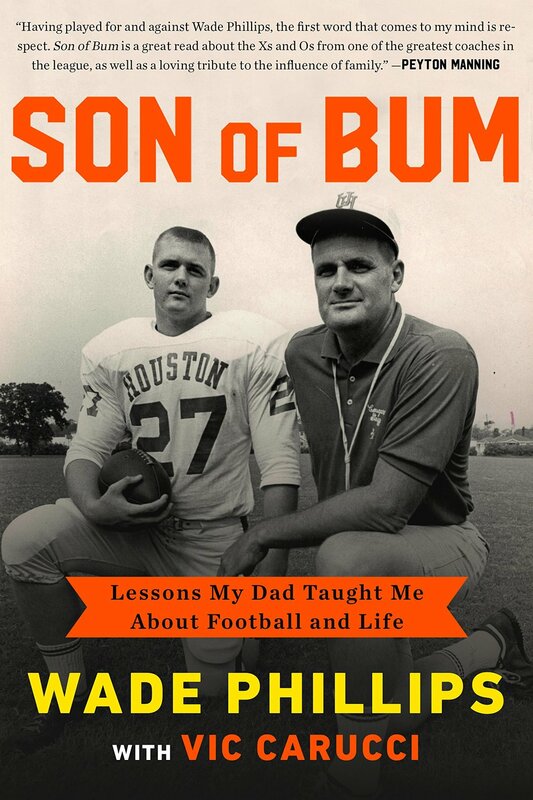 From the publisher: In his memoir Son of Bum, decorated NFL coach Wade Phillips shows that the roots of his knowledge come from his father, Bum Phillips. A beloved character in NFL history, Bum taught Wade from the beginning that “coaching isn’t bitching,” as well as how to have perspective on the game during tough times. These are lessons that apply both on the field and off, and Wade has passed this wisdom down to his son, Wes Phillips, an NFL coach himself. From the publisher: Rob “Gronk” Gronkowski holds nine league-wide records and three Patriots franchise records. His accomplishments include thirty-eight receiving touchdowns in his first three seasons (thirteen more than any other tight end in the NFL) and the 2011 record for most touchdowns made by a tight end, with seventeen receiving and eighteen overall. With a Super Bowl victory under his belt and a nationwide reputation for a personality that’s “comedy gold” (CBS Sports), he has continued to win the hearts of fans through his fun-loving attitude. Brett Favre and the Packers won Super Bowl XXXI in 1997. From the publisher: In Gunslinger, Jeff Pearlman tells Brett Favre’s story for the first time, charting his unparalleled journey from a rough rural childhood and lackluster high school football career to landing the last scholarship at Southern Mississippi, to a car accident that nearly took his life, and eventually to the NFL and Green Bay, where he restored the Packers to greatness and inspired a fan base as passionate as any in the game. Yet he struggled with demons: addiction, infidelity, the loss of his father, and a fraught, painfully prolonged exit from the game he loved, a game he couldn’t bear to leave.